Packing for a weekend trip is an extremely common struggle. Personally, I have always been a light packer, but the consequence is the risk of not having enough options. So how can you guarantee you're packing enough to survive but not overpacking? And what is the best way to organize it all? Since I've been traveling so much recently, I have really learned how to strategize which items to pack and how to pack them so that I can optimize my space. 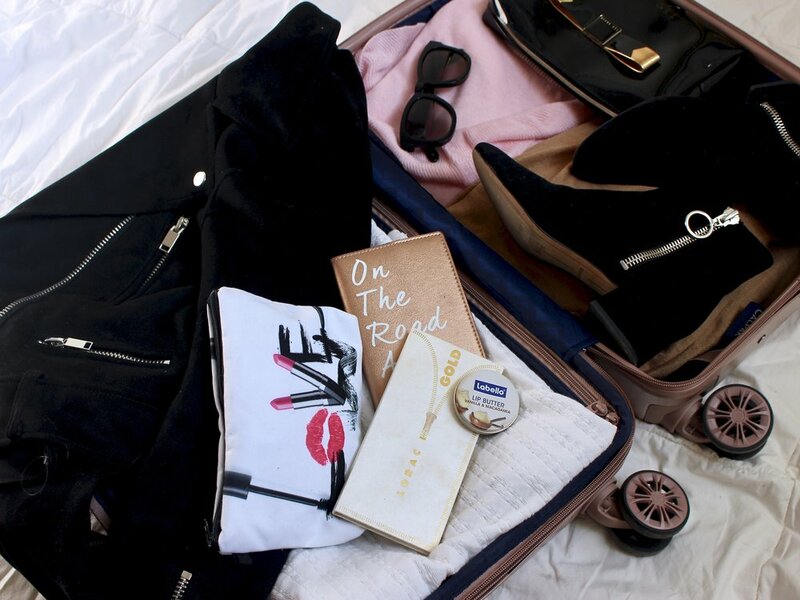 Below I have listed all the techniques I use while packing for a weekend trip so that hopefully it can help you next time you're on the go! The first few items you should lay out are basics. If you're not sure what qualifies, here's my list of basics. Because the most functional wardrobes are built around basics, choosing accent pieces allows you to be functional and trendy at the same time. If you're not sure what qualifies as an accent item, I've listed my favorites down below. The rule of thumb I suggest you follow is to aim for 1-2 accent items per outfit. Before deciding what goes inside any smaller cosmetic bags, make sure you're buying ones that are big enough to hold your items, lightweight, and contain multiple compartments. Below are my favorite options while traveling, and they save my life when it comes to fitting all my makeup & toiletries. You can use these for ALL loose items. I usually use one for electronics, one for makeup, one for jewelry, and one for toiletries. In a ziplock bag, put together socks, bras, underwear, bathing suits, etc. so that loose items aren't taking up extra space. I also prefer to ziplock any liquids I have and then put them inside of the toiletry or cosmetic bag. I love to use the rolling method because it keeps my bag tidy and condenses everything. Basically I roll a layer of clothes until it fills the bottom of my bag, then place 4 pairs of pants on top, then repeat. Follow the diagram below for a more detailed explanation. If you happen to lose your medication, this is a way to guarantee you don't lose an entire bottle. It also is just more convenient for travel and takes up less space than a round bottle. Although this might seem odd, this is the best way to avoid getting your clothes wrinkled or dirty from loose items or shoes. I reserve one side of my luggage for clothing, and then the other side for my shoes, cosmetic/toiletry bags, and sometimes jackets as a top layer.